This is an exact copy of the famous Anglo-Saxon poem: Beowulf. 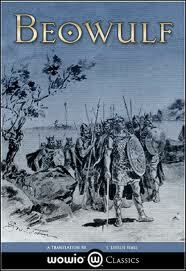 The epic begins following the great Scandinavian hero Beowulf in the 6th century. Beowulf marches with his fourteen warriors to Denmark to defeat an ancient evil. Arriving at Heorot they find the king of Heorot Hrothgar, who is terrified by the monster known as Grendel and Beowulf vows to vanquish this evil from the world. Beowulf is a true example of heroic literature, he blindly follows his path that he believes has already been chosen for him by fate and destiny.